Have you heard of this system? Well up to a couple of week ago, we had not. Over the weekend we worked with this system on a large scale event. We were provided with the handheld units and the control system. We could go into a very poor attempt of explaining the system, but why not see what the company says about it. We set up a control loom within a building; a modern office space, concrete and steel construction with double glazing. The base of operation was the city of Glasgow. The event was a road event with a route from Glasgow to Edinburgh; with the route running 46 miles. Handsets – They are lightweight, which is a massive bonus, they where robust enough to handle being used on an event and the usual knocks and bumps. The earpieces supplied where comfortable and reliable. We had two thoughts on the batteries, but as soon as you are aware of this you can account for it. We used the radios over a 12 hour period, across the course we only had a couple of battery failures and we know the reasons. Our controllers – they were listening and transmitting over the full period of time. But, we had a headset plugged into the laptop as well; this meant we would never be out of touch. 11 hour battery life is more than would be required at the majority of events and carrying a spare solves battery death on long events. Out of all the units we used, only a couples batteries drained. We knew the reason and again a spare would resolve any issues. The radios work on the phone networks just like your mobile phone and just like them, they suffer when in a poor network area (black spot). When the hand unit cannot find a signal, they continue to search. It is this search that burns through the battery; just like a mobile phone. It is only in areas of poor network you would have to worry about this and this is limited across the country. Quality of signal – Again; just like a mobile phone, the signal is reliant on the network. You get the same quality of a phone call. Control Software – Or Dispatcher Software in this case. It turns your window based computer/laptop into the interactive hub of the operation. You can use the laptop to communicate to the handheld units, you can see the identification number of the operator and how many users are live. But, the most useful things for our control team was the GPS tracking. GPS Tracking. How many times do you have long winded radio conversations with operator’s attempting to gain details of their location? This system allows you to end that. 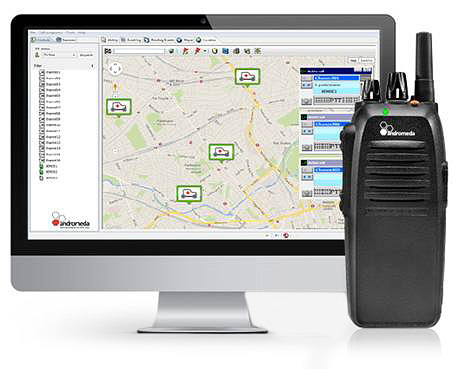 GPS tracking can allow you to see exactly where the operator is on the mapping software provided in the dispatcher software. This can be a ping to the unit to gain the location or a constant stream. As informed by the company technician, the more you track the unit; the more the battery has to more and it will drain quicker. Although we could see the benefits of full time tracking, we did not need it when using it. Finding the exact location of a member of staff miles from our location, where we could not physically see, that was invaluable. We were able to direct emergency services to the correct location; we could tell if the operator was in the location we had dispatched them to……invaluable. This equipment was provided for us, so we cannot comment of costs of the equipment. In this case, we are rather grateful about this. We were able to just look at the equipment, the service without financial implications.